Pharmaceutical companies are driving innovation to develop new drugs. In recent years, they have been actively developing biological products, such as antibody medicines and therapeutic proteins manufactured with living cells, in addition to producing drugs by chemical synthesis, which has been the mainstream approach hitherto. Yokogawa brings new products and services to this technological innovation and provides added value to the R&D and production activities of pharmaceutical companies. To that end, Yokogawa is currently developing technology for the stable and efficient operation of the cell culture process, which enables cells to produce biological products. Specifically, technology that monitors the state of cells in culture and the number of living cells, plus technology that predicts and controls the state of cells, are being developed. The normal cell culture process is carried out while monitoring the surrounding environment of the cells, such as the pH of the medium and the concentration of oxygen. Using the monitoring technology developed by Yokogawa, the state of cells in a culture tank can be known in real-time. Predictive control technology allows the change of state accompanying cell proliferation to be predicted, such that the necessary nutrients can be added when needed. This means that cells can always be cultured under optimal conditions for producing biological products. Yokogawa aims to provide cell culture systems integrating our proprietary technology that can be used as a bio production platform for everything from R&D laboratories to manufacturing plants. 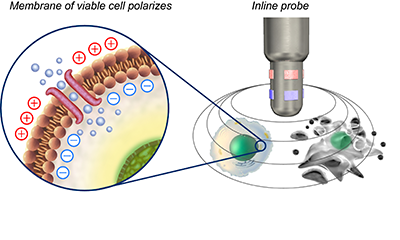 The concentration of nutrients taken up by cells and the concentration of metabolites that cells expel extracellularly are measured in real-time using near-infrared (NIR) spectroscopy. Because nutrients and metabolites absorb near-infrared light, a measurement probe installed in the medium captures the change in concentrations by acquiring the near infrared absorption spectrum. Cells absorb nutrients and metabolize them to generate energy, which is used to produce therapeutic antibodies and proteins. By monitoring the nutrient (glucose) absorbed by the cells and the metabolite (lactic acid) discharged from the cell through metabolism, the state of cells in culture can be measured. 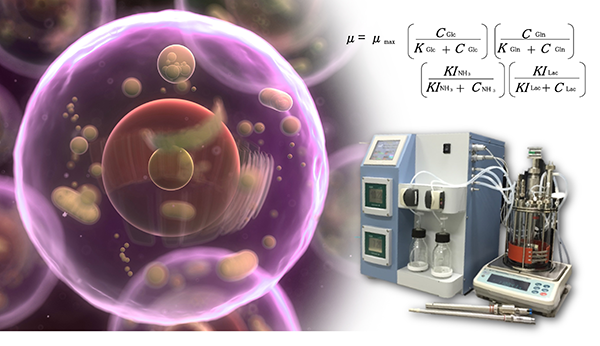 The number of living cells is counted using the electrical impedance method. Living cells present in an electric field cause a phenomenon called dielectric relaxation that polarizes the electric charge inside and outside the cell membrane. The polarization of the electrical charge, however, does not occur in dead cells because the cell membranes are ruptured. As a result, the capacitance of the medium changes in proportion to the number of living cells. Using this characteristic, the number of living cells can be counted by measuring the change in capacitance of the medium with a measuring probe in the medium. By modeling cell movement with mathematical equations, the metabolic state of cells can be predicted, and the cells can be controlled in an appropriate culture environment for them to produce therapeutic products. Changes in cell metabolic status are manifested by changes in the growth rate and nutrient consumption rate of cells. 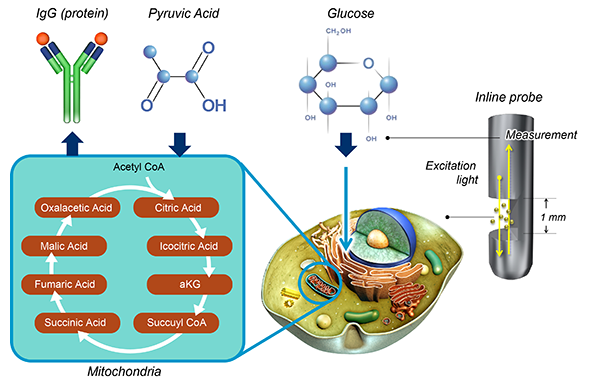 Thus, the cell growth rate and nutrient consumption rate are estimated and predicted by constructing a mathematical model of cellular metabolism with inputs of the number of living cells and concentration of nutrients and metabolites measured in real time. It is then possible to maintain an optimal state of the cells by controlling the culture environment based on this prediction. 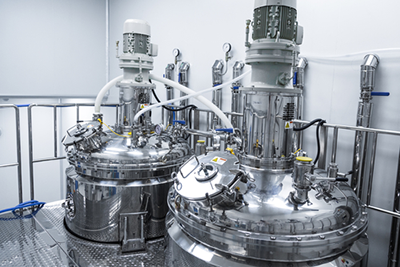 Yokogawa aims to go beyond the pharmaceutical industry and provide a variety of industries with a bio production platform focused on cell culture. Yokogawa contributes to the improvement of product yields and quality stability in the cell culture process that produces biological products. Moreover, in the production of biological products in recent years, a next-generation production method that continuously cultures over a long period of time is expected. With continuous culturing, it is necessary to constantly monitor the culture state and keep it stable. Yokogawa believes that the in-line measurement and prediction control technology it has developed will be effective tools. Recently, various industries expect to see the production of materials and substances with a high added value by living organisms (microbes or cells). For example, in the energy industry, the production of alcohol is based on biomaterials; in the food industry, it is the development of new bacterial strains; and, in the basic materials industry, it is the production of lightweight and highly rigid new materials, all of which are expected to be realized with microbial fermentation and cell culture processes. 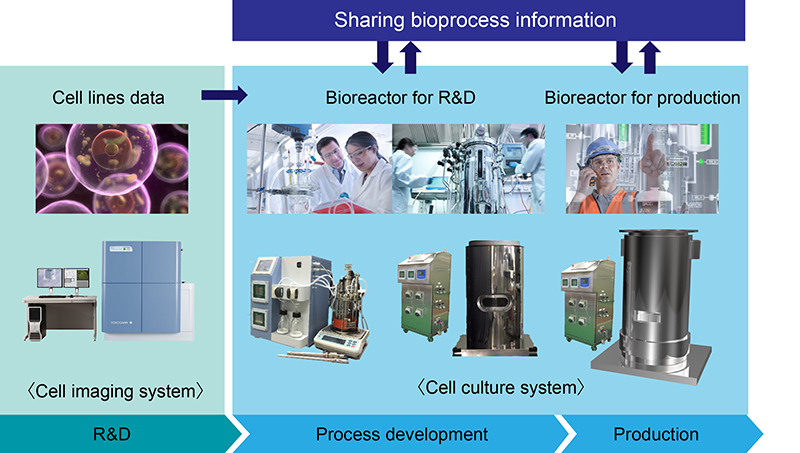 Yokogawa aims to contribute to the further development of industry by applying these development technologies to similar products, and to realize new biological production systems with microbes or cells as microplants.